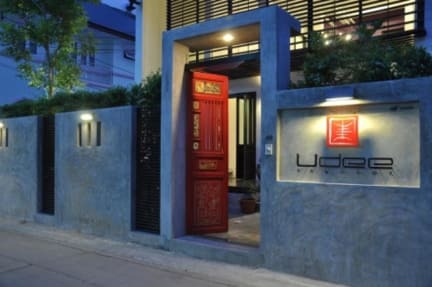 We like Udee Bangkok's location in a quiet street surrounded by food stalls. It's located near Chatuchak Weekend Market as well as the metro and Skytrain. This clean, stylish and comfortable hostel has staff who are very highly rated here on Hostelworld for their knowledge of off-the-beaten-track things to do in Bangkok. Our travellers say the staff create a 'relaxing, go-with-the-flow atmosphere' and that they'd recommend it 'to everybody looking for a nice and beautiful place'. One user told us it's 'not a party hostel but it's easy to find and connect with people' here. My stay with Udee Bangkok was amazing. Since the room we booked was under construction, they bumped us to a better room with no additional costs and the owner was wonderful with his reccomendations on everything from transportation around the city to the spots to visit. A few hours before departing from Bangkok, I lost my phone (I left it in a Grab taxi that I ordered myself) and he did everything he could to help me get it back after we got through to the driver by liaising with him in Thai! Excellent vibe and location just a walk away from Chatuchak weekend market - charming place and very friendly staff. Facilities are great and can accommodate single travelers or couples (we were the latter). 24/7 security, free lockers, free home-cooked breakfast & coffee (much better than average). feels like a home away from home. there are even shower facilities for pre/post check out and resources to help you navigate the city. The best hostel from all Bangkok! The staff is super friendly and always there to help you for anything you need. Excellent place to stay. Very clean, safe, and quiet. The ONLY reason I didn’t give it a perfect score is that it is a little ways away from most of the tourists attractions. On the other hand, it is quiet, and that is a welcome thing after a day of Bangkok city noise. A bit of a walk, but the place is worth it. I liked that it was quiet. This hostel is very close to Chatuchak market and 6-7 kms to bustling khao san road. Its super clean but there were not many guests. Breakfast was standard. Good place if you are looking for something near DMK airport. Hostel was clean and comfortable. Small area for sitting and hanging out. Staff was helpful with everything we needed. It was pretty far away from most of the sights we wanted to see. Howcever, the neighborhood was quiet and it was easy to get to and from the airport. Our hostel is a cosy home-away-from-home in Bangkok. Despite being located in one of the busiest cities in the world, our hostel is a little piece of serenity and peace in the bustling city. I recommend that guests visit Chatuchak, the weekend market where you can find anything you could possibly imagine. The market is walking distance from our hostel or a quick ride away by public transport. All of Bangkok's attractions are easy to reach by skytrain, underground, bus or other public transport. I think the best thing about the neighbourhood we\'re in is the number of food stalls and fine restaurants. They\'re all within walking distance and you can try all the food that Bangkok has to offer! If you want to escape the busy city, I think our hostel is the perfect place to relax and share a drink and chat with fellow travelers from around the world.